MK Dons are still sweating on whether Alex Gilbey will be available to play against League 2 leaders Lincoln City on Saturday. The midfielder limped out after just 15 minutes against Yeovil nearly two weeks ago, and has not trained since. 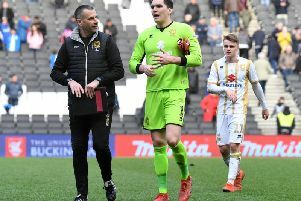 Having missed just one league game all season - the away game at Forest Green on Saturday - Gilbey's availability is going to be left until the 11th hour before Tisdale makes a decision. "I'd like to think (he's in contention)," said the manager. "He still hasn't trained, we've still got a couple of days, we're at that part of the season where we have to keep everyone alive as long as possible. It has dragged on a bit longer than I'd have hoped. Hopefully, Alex will be available on Saturday." It is unlikely that defenders Baily Cargill, Jordan Moore-Taylor or George Williams will return this weekend either, but with the latter two back training on grass again, Tisdale praised physio Simon Crampton and his team for working all hours to get the players back as quickly as possible. Tisdale said: "George and Jordan are making progress, and it's great to see them in training." "Simon and his team as always are working every hour. I'm working pretty late at the moment, and they're always still here, and when I get in early, they're here. There's a lot of work for them but they're putting a lot of effort into getting everyone fit. You have to continually try and get a team on the pitch but you're always looking ahead."